by the news media. For the record, HIRA completely agrees with this assessment. With less than 300 hours to go until votes are counted on November 8th, the latest pronouncement that H.R.P. is R.I.P. comes TODAY from Civil Beat columnist Neal Milner, whom you probably recognize from hundreds of local TV news interviews about political issues and especially biennial election night live TV coverage of ballot counting. 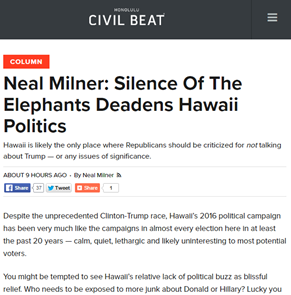 Today's thoughtful Milner column (right) echoes the same themes as Rick Hamada's (and his listeners) entirely justified on-air 'tirade' against the Hawaii GOP just last week . . . which are the very same themes that HIRA has been emphasizing for years: You cannot win with silence. You cannot win with neutrality on issues. You cannot sit dormant for 24 months between elections. And GOP candidates cannot get elected unless and until our party makes the case. 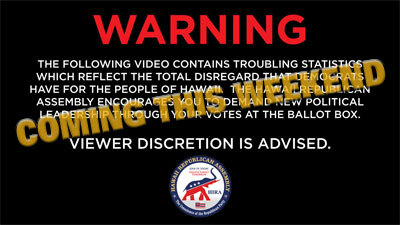 What's worse, the RINO's and closet Democrats who have been running the Hawaii GOP (a.k.a. Team Hellreich) for the past two decades know better. "The state Republican Party no longer participates in political discourse in any significant way . . . The state's GOP has gone silent." "Tea party people and other conservative rivals like the Hawaii Republican Assembly call the state's Republican leaders RINOs - Republicans in Name Only. In fact, a better description of the state GOP is PINOS - Party In Name only." "There are some conservative voices like Sam Slom, Rick Hamada, and HIRA. That's about it for visible representatives of conservative beliefs." "What Republicans believe and do in Hawaii is a well-kept secret, and the biggest keeper of the keys is the party leadership itself: GOP leadership as super-secret squad." "Two bad things result from this silence of the elephants. First, it offers no alternatives to the consensual, sort-of-liberal politics in the state. Second, that lack of discourse conceals some very important things about both Republicans and the state as a whole, things that we need to understand in order to better rid ourselves of the usual myths and conceits about this place." "But for goodness sake, a political party - even a minority party - that appears to have gone mute and underground?" "Don't think about this as the "need to maintain a vital two-party system." That's too civics-lesson and too sterile-a dispassionate cliché. 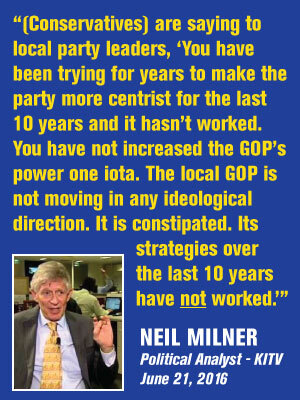 Think of this as a Republican failure that contributes to the further diminishing of our civic life." 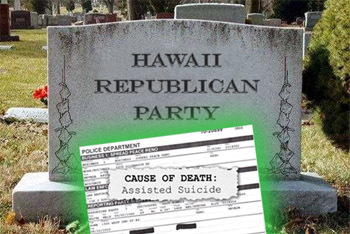 Milner focuses on the root cause of Hawaii's tragic GOP suicide: the unwavering commitment by state and county party leaders to be silent, neutral, disorganized, and dysfunctional. Milner even reveals party leaders (wittingly or unwittingly) as appearing to be ashamed that they are Republicans at all. The only question left unanswered by Mr. Milner is this: Why they are even holding those party offices? In other words, why do Hellreich and her buddies feel compelled to call the shots decade after decade? Ultimately, as Hillary Clinton might argue before the Benghazi Committee, at this point the answer to that questions doesn't really matter because it makes no difference. Team Hellreich and its various subsets of RINO minions and closet Democrat brown-nosers NEED TO BE OUSTED FROM POWER. Democrats won't 'unelect' themselves. 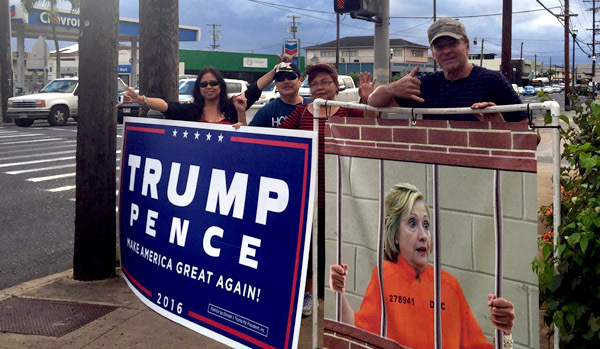 Only a well-run, highly principled and completely determined Hawaii GOP has any hope of saving Hawaii from the failed, destructive policies of the ruling Democrat majority. Short of that, it's Hellreich's expensive social club with a fancy suite of offices, delusions of grandeur and a record of abject failure in fulfilling the party's primary duties. 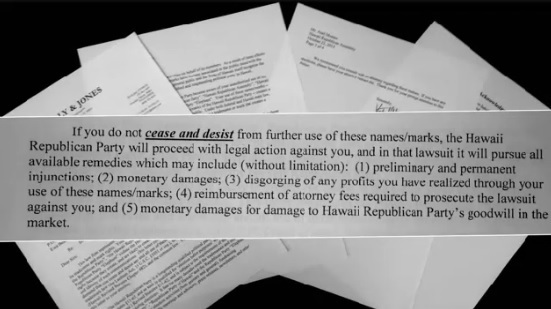 Finally, as HIRA has previously reported, the Hawaii GOP used money stolen from party donors to hire a Democrat union attorney to threaten HIRA with legal action unless we shut down. The real aim of the threat was to keep HIRA from making our statewide case to the public for throwing Democrats out of office and electing Republicans instead. BIG ANNOUNCEMENT: HIRA has decided to ignore the endless threats from Fritz "the Embezzler" Rohlfing, Miriam "the Empress" Hellreich, Pat "Abortion Barbie" Saiki, and Barbara "I Love Obamacare" Marumoto and the rest of the do-nothing losers in the Hawaii GOP 'leadership'. They are leading Republican candidates down the road to ruin. This weekend, thanks to generous donors like you, our official SuperPAC HIRA Action will begin pushing out our "Vote Republican" promotional campaign designed to help ALL Republicans with their races by making the case for change and by directly attacking the rationale for keeping Democrats in office. SIDE NOTE : By the way, making the case for Republicans (and the case against Democrats) is the job of the state and county parties. THEY HAVE REFUSED TO DO SO. HIRA and HIRA Action are stepping in -- despite legal threats from RINO party leaders using stolen monies to pay Democrat union lawyers -- because Team Hellreich has hijacked the GOP and destroyed the one organization in the Aloha State with local ballot access and national ties which could save Hawaii from going down the tubes. This weekend, you will see for yourself EXACTLY what messaging to the public that Hellreich, Rohlfing, Saiki and Marumoto threatened HIRA about in order to force HIRA to keep said messaging under wraps . This weekend, you will see what they are so worried about . And, yes, it will make Hellreich's Democrat buddies very upset that she failed to keep ALL Republicans silent and ineffective for 24 months through yet another election cycle. HIRA will never be silenced. HIRA , the Hawaii Republican Assembly, is the agent of change that Republicans and conservatives have been waiting for. 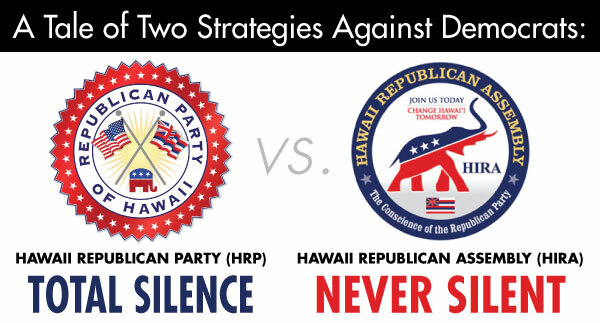 Not only is HIRA directly supporting candidates and paying for advertising in support of 'voting Republican' and promoting our solutions and reforms, HIRA will be leading the effort in 2017 to ' repeal and replace' the RINO party officers who have destroyed any hope of a two-party system in Hawaii. Stay tuned for more information about this following November 8th . Thanks again for taking time to understand the battle Republicans face here in Hawaii. We gotta fix our party before we have any hope of taking on the Democrats To this end, mahalo for your financial support for HIRA and our official SuperPAC HIRA Action. And many thanks to those of you stepping up to volunteer with HIRA to fix the party in 2017. Once again, best wishes to all GOP candidates on the ballot in 2016. In less than 300 hours, the battle of 2018 gets underway.